(18th century), Architect: Giorgio Massari. The particularly beautiful Rotonda di Badoere originally included two large "barchesse" with double semicircle and, 300 meters west, the main villa that was destroyed by the fire in 1920 during a farmers' riot. 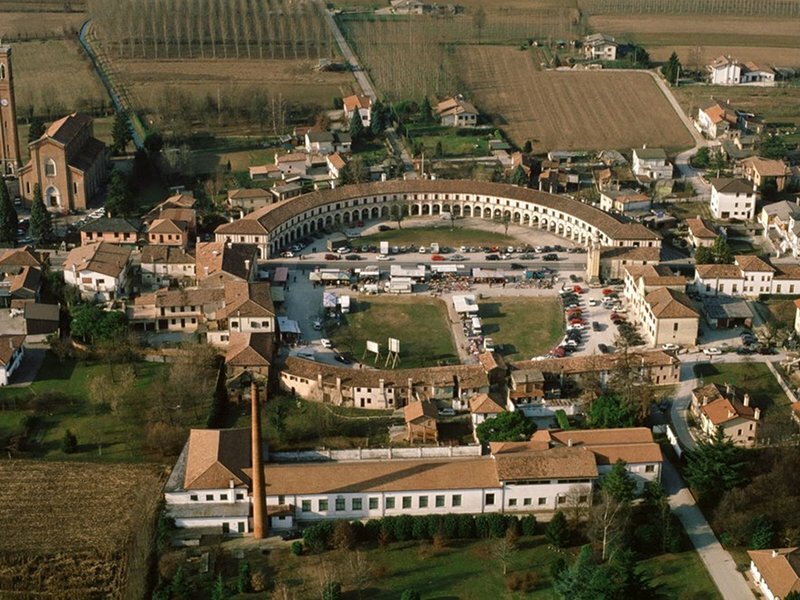 It was created thanks to the Badoers, a noble Venetian family which owned the ground where the Rotonda was built (called Zeruol di Sopra), according to a project of the Massaris' school. The Badoers built the small church dedicated to Anthony of Padua in 1645 and the Rotonda, whose function was to house the Monday market authorized by the Republic of Venice in 1689. Particularly original is the western "barchessa" consisting of 41 arcades corresponding to as much shops owned by artisans and merchants. The shops under the porticoes had an entrance situated within the Rotonda and a balcony that could be opened upwards and functioned as a shop window, which has been enhanced by the recent renovation works.